The Savannah Tree Foundation is happy to announce the availability of a small revolving fund called the CommuniTrees Fund, dedicated to helping community organizations purchase and plant canopy trees. “Our new CommuniTrees fund helps answer the need for smaller tree plantings than we can typically accommodate,” stated Diane Houston, President of the Savannah Tree Foundation. Savannah Tree Foundation usually plants 50 or more trees per tree planting because the amount of planning required to carry out a large scale tree planting is relatively the same, whether planting 50 or 250 trees. “We often get requests for one or two trees, sometimes four or five or ten trees, and this program was created for that reason,” said Houston. The program commences in the Fall of 2010 with seed money from the Trustees Garden Club, and is replenished with donated funds given through Savannah Tree Foundation’s Holiday Plant a Tree program, which enables individuals and businesses to plant gift trees in honor of or in memory of someone special or to commemorate a special occasion. The purpose of this program is to assist non-profit groups, neighborhood associations and other community organizations with small tree planting requests of 1-10 trees, on property that is held in trust for public use. Securing and documenting permission of property owners to plant trees on property. Provide a donation to STF toward the cost of trees. There is no minimum donation required. Pick up trees at a community volunteer tree plantings and participate in the tree planting if possible, to learn first hand how best to plant a tree. 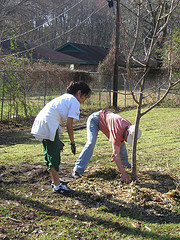 Plant the trees during tree planting season, which runs from November to February/March. Commit to watering and maintaining trees for 2 years. Savannah Tree Foundation provides 15 gallon trees plus advice on siting trees, selecting species appropriate to a site, tree planting techniques, and ongoing maintenance. Guidelines and application forms are available online or by calling 912-233-TREE.